Synopsis: In addition to an introduction and a concluding essay, Balchin presents the reader with thirteen pen portraits of notorious villains from throughout the course of history. The rogues subjected to scrutiny include Judas Iscariot, Richard III, Guy Fawkes, Robespierre, Rasputin and the Marquis de Sade. Context: The author had of course written an historical novel (The Borgia Testament) about another infamous villain two years previously and may have been in an historical mode having extensively researched Cesare Borgia for the novel. Balchin once complained in an interview that he was always wanting to write non-fiction but that no-one would ever let him; this was an attempt to redress the balance. 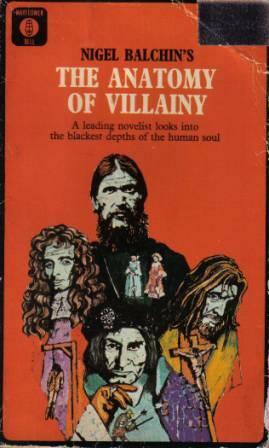 Verdict: Although it’s very hard to appreciate this book fully without a better grasp of history than that possessed by this reviewer, I’ve always found The Anatomy of Villainy quite a difficult read. The almost total absence of Balchin’s trademark sense of humour makes much of the material seem rather intimidating, although one undoubtedly learns a lot from perusing these pages. The descriptions of latter-day villains such as the fake medium Daniel Dunglas Home and the serial murderer George “Brides in the Bath” Smith are the ones that I find the most interesting. Availability: Fairly straightforward to find, especially in the original hardback version.